May your New Year be happy and healthy. May it be filled to overflowing with good friends, joyful memories, laughter, discovery and artful journeys. May you see through the eyes of a child, and may your heart be filled with peace, love and gratitude. May 2010 be filled with many blessings for you and yours! Although there's been precious little time spent in the studio lately, I managed to make time to finish this last piece of the year for a "Dreamers" swap. Given the same subject, it always amazes me to see each artist's interpretation of a theme. 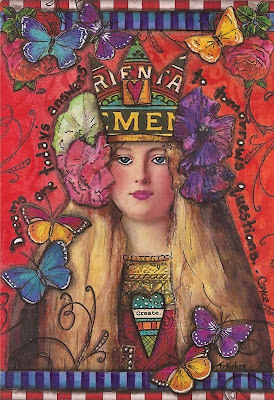 Credits: Image of the dreamer - Becky @ WhymsicalMusings.blogspot.com; crown, borders and "create"heart - Marsha @ TumbleFishStudio - Etsy; assorted butterflies from Dover Publications. To all of my dear friends and visitors, I wish you and yours a very blessed Christmas filled with peace and love. May your homes be filled with the joy and laughter of family and good friends, and may you have many wonderful memories of this beautiful season. Warm wishes for a very Merry Christmas! Bob Dylan like you've never seen him before. Hope this brings a bit of Christmas cheer and a chuckle too! 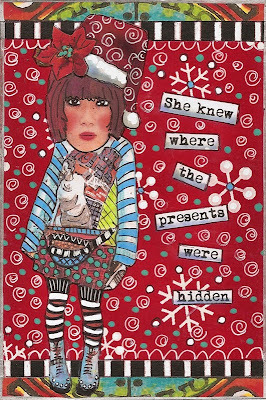 When she was lucky enough to find the treasures, she'd peel away the wrapping paper painstakingly to take a quick peek. Then, she'd meticulously re-wrap the packages to make them look as though they had never been touched. No wonder my husband's nickname for her was "Imp!" Heartfelt wishes for a wonderful Christmas filled with many blessings. May your day be filled with peace and love; and may your celebrations be filled with the laughter and joy of good friends and family. Merry Christmas! Wishing you a season of joy & peace! 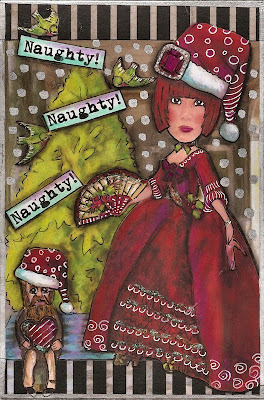 Credits: Patterned border - TumbleFish Studio; Santa hat & poinsettia - Lisa's Altered Art. 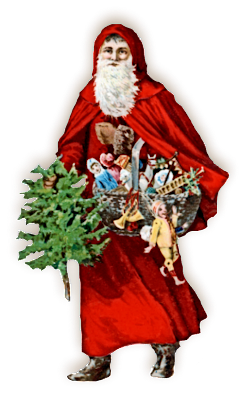 Quick question: Why does Santa get all of the credit, when it's dear Mrs. Claus who's been gathering the gifts, sending the cards, wrapping the presents and cooking and cleaning for the big day? It's not that I'm complaining, and I know it's a rhetorical question. However, since I'm up to my ears in last minute Christmas preparations, I can't help but ask. I guess the old saying, "It takes a woman to do a man's job" is true! LOL! Here's hoping that your preparations are almost complete and that your sense of humor is still intact! 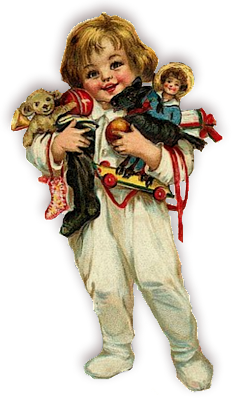 The inspiration for this postcard came from memories of when my four children were very small. Around Christmastime when asked "Who made this mess?" or "Who is responsible for . . . . .? ", all four answers were always the same and were said with utmost sincerity. The answer was always: "I don't know - not me!" Sometimes it took everything I had to keep a smile from appearing on my face during those "teachable moments"! When I saw this little girl, the look on her face reminded me of those "honest" childhood answers, and the memories came flooding back. Without further ado, meet "Not-Me", the Naughty Elf!!! Hope you have a day filled with wonderful memories! 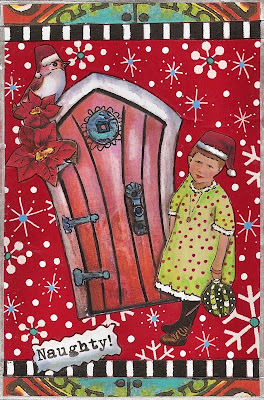 Credits: Girl in green dress, the Santa hat, ornament, Christmas bird and pointsetta flowers from Lisa's Altered Art - Etsy; the enchanted door from Artsy Fartsy Queen - Flickr; and the turquoise border from TumbleFish Studio - Etsy. I've had a lot of fun this year making Holiday postcards. 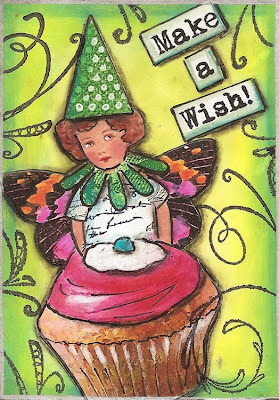 It all started innocently enough with a few cards that I made for a swap. An then another idea popped into my mind, and another and another! This was sent to a dear friend to make her Holidays a bit brighter. 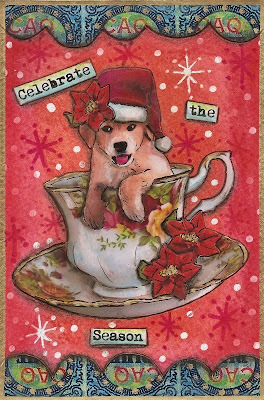 After gluing the sweet image of the puppy (CassisCrations - Etsy), the border (Tumble Fish Studio - Etsy), the Santa hat and flowers (Lisas Altered Art - Etsy), and the computer-generated text, I used a white paint pen to add some background dots, and a pink marker and white gel pen to add the snowflakes. All of the images were further enhanced with watercolors and Prismacolor pencils before being outlined with a black Pitt pen and some smoodged charcoal pencil. A touch of red Pan Pastel was added to each side of the postcard, and the entire piece was edged with a gold metallic marker. May your day be merry! This week's theme at Sunday Postcard Art is "the holly and the ivy". 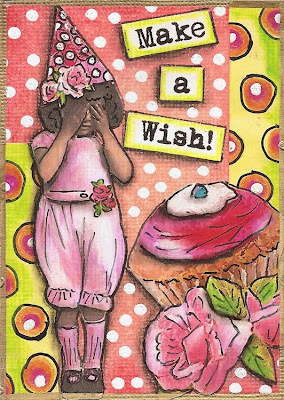 This postcard was created originally for a very dear friend. 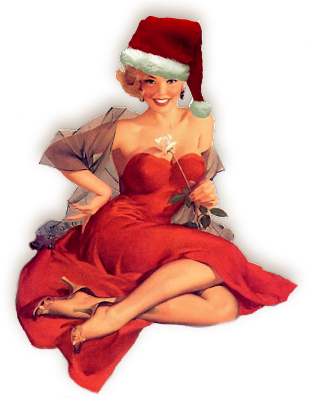 However, since my well-dressed Zetti is wearing a tiny sprig of holly at her waist, I think she qualifies for this week's challenge. Judging by the size of the ruby on her Sana hat, she must be a very naughty little girl!!! Hope your day sparkles with a touch of humor! Credits: Background, birds and Zetti body - Itkupilli; the little man - Crowabout; the tiny heart - TumbleFish Studio; Santa hats and fan - CassisCreations - Etsy. In two short weeks from today, floors will be strewn with colored wrapping paper and ribbons, squeals of excitement and surprise will fill the air, and stockings that were hung with care the night before will be emptied! This little one seems to express the joy and delight of Christmas morning perfectly. As usual, I've supplied a png and jpeg file for your creative pleasure. For my friends who are celebrating Hanukkah, I wish you a very Happy Hanukkah and many blessings! May you have a delightful weekend! As busy as we all are with Holiday preparations in full swing, I'd like to take a moment to wish all of the December babies a very Happy Birthday! May your special day be filled with laughter and delightful surprises, and may your year be filled with good health, good friends and many happy memories. Special Birthday Wishes to my awesome husband who'll be celebrating his Birthday this week, and to my sweet friend, Patty at Magpie's Nest, who recently celebrated her Birthday. Speaking of December babies . . . . Warm wishes and congratulations to Marilyn from In My Room on the birth of her first grand-daughter, Sophia Elizabeth, who was born on Sunday December 6. If you have a moment, click on the links to pay a visit to these beautiful ladies and take a peek at beautiful Sophia. 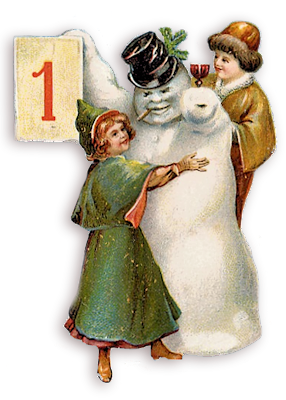 And if December isn't your Birthday month, close your eyes, take a deep breath and make a wish - a very grand wish - because your fairy godmother just may be listening! After all . . . this is a very special month! Credits: Birthday fairy wearing the green hat, the pink party hat, and the roses are all from CassisCreations - Etsy. The little pink fairy and the cupcake were one of my "freebies". Click here to add them to your collection. When something had to be done for the holidays, my wonderful sister-in-law, Ginny, had a saying that she used with great frequency: "Work smarter - not harder!" I can still see her standing in her kitchen fixing beautiful party platters made by mixing homemade treats and store-bought goodies. Always the gracious hostess, she'd flash a dazzling smile of thanks when compliments were received. I started by adding just a little distress ink around the edges and then edging the tag with a gold metallic marker. Then I got a little bolder and dabbed a little more distress ink around the edges, used Prismacolor pencils to "brighten" the image, and added some glitter for the "fluffy" effect on her muff and coat. I went "all out" on my last tag and added some flourishes with black Stazon ink and dots with the gold marker in addition to the previous additions. Although these tags are so pretty "as is", it didn't take much time to make them my own, and they'll add a very special touch to my Holiday gifts. Thank you, Lynn, for helping to make my Holidays a bit merrier and lot easier too!!! 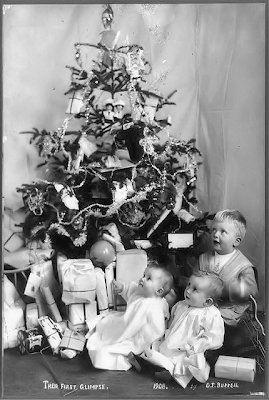 May your Holiday preparations be easy and fun! Have I ever told you how much I LOVE Christmas! I truly do! When I was a child, I tried to stay awake on Christmas Eve and would lie in bed listening for the mingled sounds of hooves and jingle bells. The slightest sound would trigger magical thoughts of an enchanted sleigh and flying reindeer. I fell asleep thinking of that jolly, old fellow trimming the Christmas tree and leaving wonderful surprises beneath it's decorated branches. Since this week's Sunday Postcard Art theme is "St. Nicholas", I had to participate, even though time has been so limited. 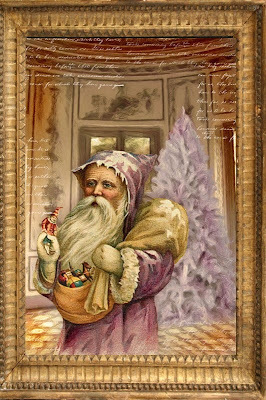 My entry is digital and uses a background and gold frame from Itkupilli, and a lovely, vintage Santa from Flickr's SuzeeQue along with several digital filters and custom faux writing stamps. 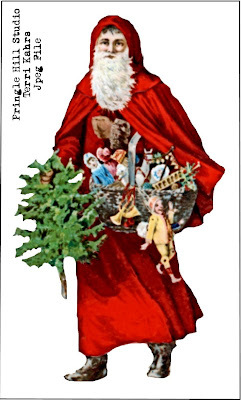 Wishing you a very happy and very magical St. Nicholas or Sinterklaas feast! For your artful Holiday pleasure! 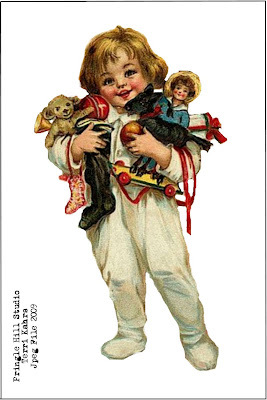 To make your Holiday Season a little merrier, thought you might enjoy this cutie pie (from the public domain). 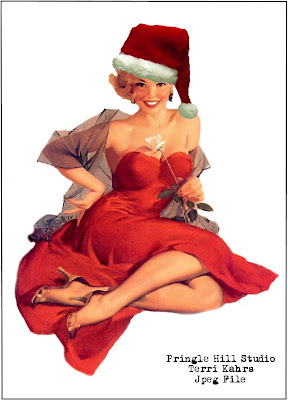 Use her for your Christmas cards, tags, bookmarks and gift labels. I'm going to use her on my cookie gifts this year. To make life a little easier during this busy time of the year, I've included the jpeg version too. Have fun! 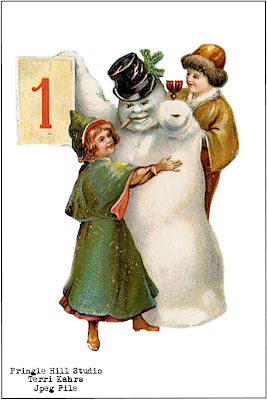 Lisa Volrath at "Ten Two Studios" is hostessing a wonderful holiday giveaway. 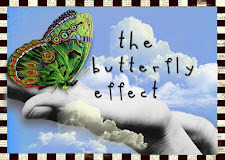 During the month of December, she's posting a free collage sheet of beautiful images every day. If you'd like to investigate, just click here and it will take you to Lisa's site. Once you're there, you'll find instructions on how you can download her great freebies. Thank you, Lisa, for your generosity and kindness! May your weekend be merry! Tonight's the night! This is the night that's signals the official beginning of the Holiday Season and the Christmas countdown for me. 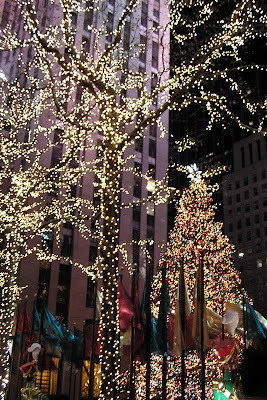 Tonight's the night that they light the huge tree in Rockefeller Center. For anyone who lives in the New York metropolitan area, this tree is the official symbol of the Season, so I thought I'd share it with you today. 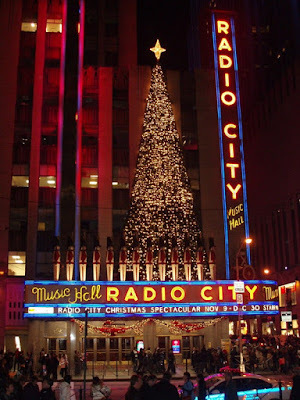 These pictures were taken a few years ago, when we went into the City on Christmas Eve. I only wish that they could convey the spirit of love and camaraderie that surround this gorgeous symbol. May your day be filled with love and hope!